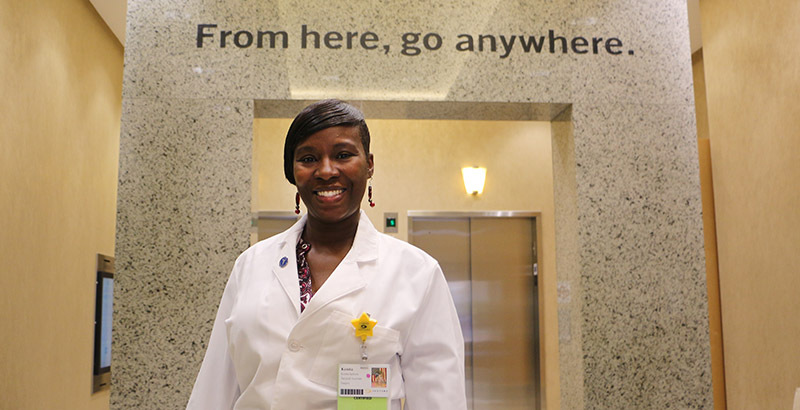 Kenita Jackson proudly wears the white coat she earned at Eastern Virginia Medical School. A newly trained surgical assistant, she helps surgeons in the operating rooms at Sentara Princess Anne Hospital. She got her start at Tidewater Community College’s Norfolk Campus. Jackson grew up in Calvert Square and saw her share of gun violence, poverty and drug use in her own apartment. She lost seven friends to shootings during her childhood. She lived with her mother and grandmother, but life spiraled downward when, at age 6, Jackson lost her grandmother. She and her sister, often hungry, resorted to “borrowing” food from neighbors, sometimes three times a day. In high school, Jackson’s grades suffered. She skimmed textbooks to pass exams, but never learned how to learn. After having a baby at 17, Jackson knew she needed to turn her life around. She tried enrolling at Norfolk State University but was denied because of grades. Jackson came to TCC for a second chance. Jackson found the support she needed at the college. Jackson began studying criminal justice but changed course when a STEM advocate, Susan Fincke, gave her a career assessment test to gauge her interests. Jackson scored high in science and medicine. Fincke encouraged her to change course and believed in her before she believed in herself. Jackson graduated from TCC with an Associate of Science in Social Sciences and transferred to Old Dominion University to earn a bachelor’s in biology. When she first applied for the surgical assisting program at EVMS, she was wait listed. A year later, she received a full scholarship. Jackson graduated from EVMS with a master’s in surgical assisting and went right to work. “One minute I’m cleaning hotel rooms for $9 an hour, the next I’m earning three times that much working in operating rooms,” she said.